Electric Charge is defined as the amount of energy or electrons passing from one body to another either by conduction, induction or other specific methods. There are two types of electric charges namely positive charge and negative charges. Charges are present in almost everybody and those bodies which don’t have charges are assumed to be neutrally charged or no charge. The nature of charges is responsible for the forces acting on them and coordinating direction of flow of them. The charge on electron and proton is same in magnitude which is 1.6 × 10-19 C. The only difference is that we show charge on proton with a positive sign and on electron with a negative sign. The S.I or Standard unit of electric charge is Coulomb. Its symbol is C and 1 C is defined as the charge flowing through a wire in 1 sec if the current flowing in the wire is 1 A. Charge of a body is measured by comparing it to a standard value. The charge is a scalar quantity as it has only magnitude and no direction. The charge is just as other fundamental properties of the system like mass. The only difference between mass and charge is that charge is both positive and negative, while mass is always positive. The charges of a system are +3 C, + 2 C, + 5 C and -4 C respectively. What would be the net charge of the system? 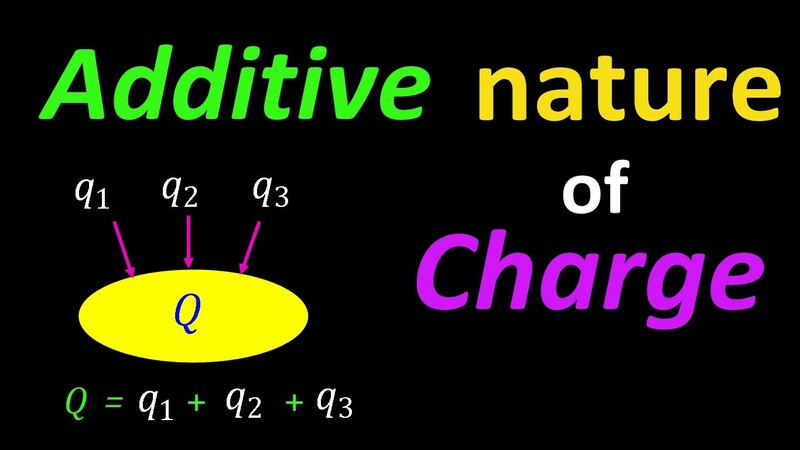 The charge is a conserved quantity which means charge can neither be created nor be destroyed but can be transferred from one body to another by certain methods like conduction and induction. As charging involves rubbing two bodies, it is actually a transfer of electrons from one body to another. We can’t create a charge in a body but eventually can transfer them to another body with some convenient methods. In a system when charges are distributed accordingly, by the principle of conservation the net charge of the system remains constant. As an example if 5 C is the total charge of the system, then it can be redistributed as 1C, 2C and 2C or in any other possible permutation, but by conservation principle the net charge of system will always be 5 C. Although the charge carriers may be destroyed in a system but the net charge will remain conserved. Sometimes a neutrino decays to give one electron and one proton by default in nature. The net charge of the system will be zero as electrons and protons are of same magnitude and opposite signs. 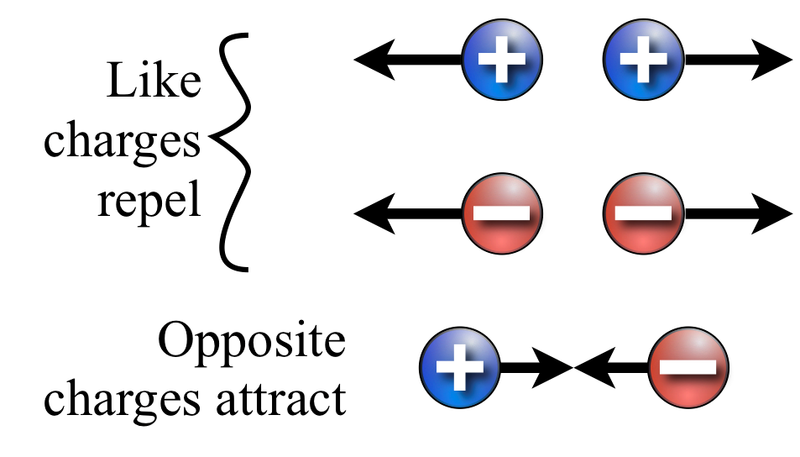 Then the net charge of the system before the creation of electron and proton (that is zero) equals to a net charge of the system after the creation of electron and proton (which is again zero). This proves the conservation principle. where n is an integer and not fraction or irrational number, like ‘n’ can be any positive or negative integer like 1, 2, 3, -5 etc. The basic unit of charge is the charge acquired by an electron or proton. By convention we take charge on the electron as negative and denote it as “-e” and charge on a proton is simply “e”. The quantization of charge principle was first proposed by English experimentalist Faraday when he put forward his experimental laws of electrolysis. The principle was finally demonstrated and proved by Millikan in 1912. 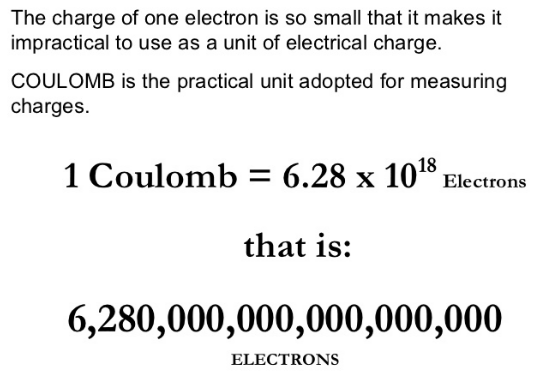 1 A Coulomb of charge contains around 6 × 1018 electrons. Particles don’t have a high magnitude of charge and we use micro coulombs or milli coulombs in order to express charge of a particle. The principle of quantization can be used to calculate the total amount of charge present in a body and also to calculate a number of electrons or protons in a body. Suppose a system has n1 number of electrons and n2 number of protons, then total amount of charge will be n2e – n1e.